Bangladesh's central bank has filed a lawsuit in a New York court against a Philippine bank, seeking damages and the return of $81 million stolen from its account with the Federal Reserve Bank of New York in 2016, an official said Friday. Abu Hena Mohd. Rajee Hassan, head of Bangladesh Bank's Finance Intelligence Unit, confirmed that the case was filed in the Southern District Court of New York against Manila-based Rizal Commercial Banking Corp., or RCBC. "Yes, we have done it online through a firm there and it has been accepted," Hassan said. "Our next procedures will follow accordingly as we want our money back. This is our people's precious money," he said. Court documents say hackers from North Korea used fraudulent orders on the SWIFT payments system to steal the money. 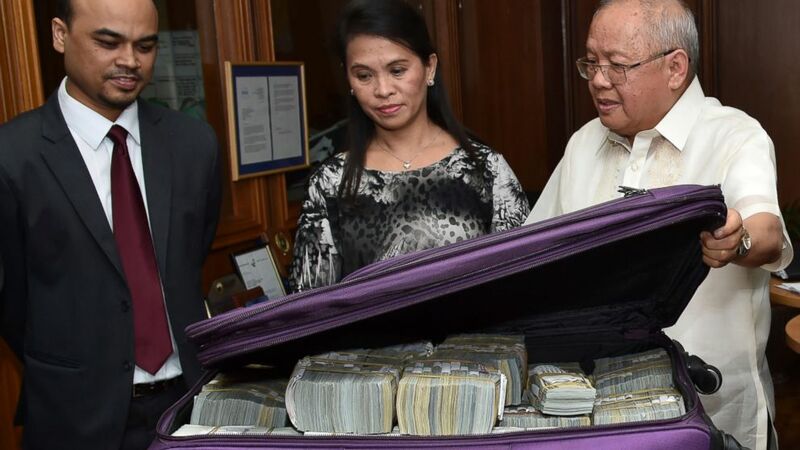 The money was sent to accounts at the Philippines' bank and then vanished into the casino industry in the Philippines. The complaint says the funds' ultimate destination remains unclear. Bangladesh Bank is seeking the $81 million plus damages and legal costs. RCBC issued a statement saying it was aware of the case and had hired a prestigious law firm, Quinn Emanuel to lead its defense. The lead attorney on the case, Tai-Heng Cheng, issued a statement describing the lawsuit as a "thinly veiled PR campaign" and "baseless." "Not only are the allegations false, they don't have the right to file here since none of the defendants are in the U.S.," Cheng said in the statement. "We will show this suit is nothing more than a political stunt by the Bangladesh Bank to try to shift blame from themselves to RCBC." The heist was a major embarrassment for Bangladesh's Prime Minister Sheikh Hasina as the opposition criticized her administration for failing to protect public money. The then-central bank governor Atiur Rahman resigned and Hasina ordered an investigation. Citing case documents, Hassan said the complaint accuses the Philippine bank of following fraudulent procedures at every step. The hackers broken into Bangladesh Bank's system and created 70 orders to the Federal Reserve Bank amounting to $1.94 billion. Of that amount, $101 million was released. The hackers sent $81 million to the RCBC's branch in Manila and the rest, $20 million went to Sri Lanka, which has returned the money to Bangladesh. The Philippines later returned $14.54 million but the rest is yet to be retrieved. The complaint against RCBC names 23 people by name, including Filipino and Chinese citizens and cites another 25 unnamed "John Does" as defendants. The money trail laid out in the court filing ends with it disappearing into casinos and gambling junkets in the Philippines, and to its "ultimate destination, which has yet to be uncovered." All of the defendants "had a single unlawful purpose: to defraud, steal and launder funds stolen from the bank," it says. The filing asserts that RCBC made potentially hundreds of thousands or millions of dollars from the fraudulent transactions allegedly conducted through its accounts and that various employees gained substantial sums through their alleged involvement.